Much like last week, the problem with this trick wasn't that the parts were hard. 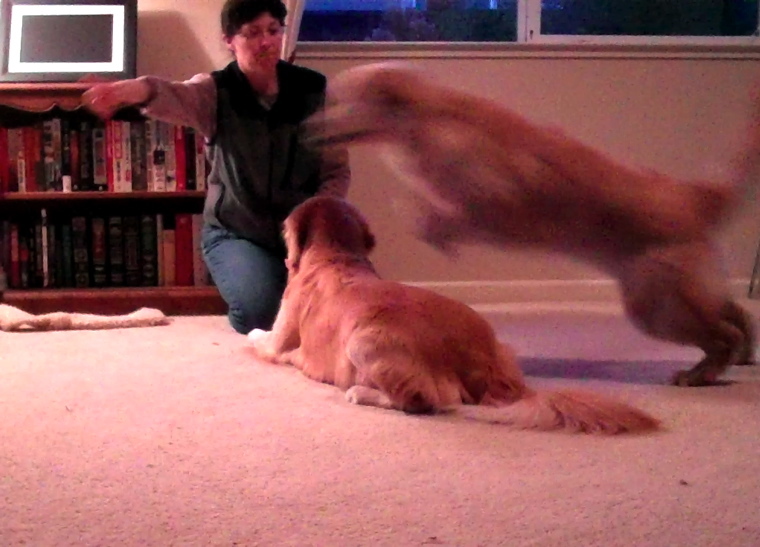 One dog lays down, the other jumps over the first. No worries, right? Not only do we have the "which hand is my hand?" 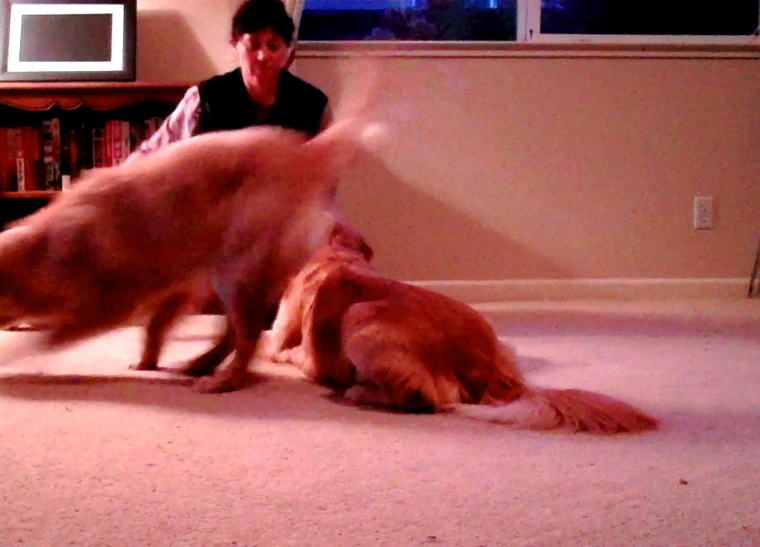 problem (see Trick 8 - Tandem Spin) but now we have the dogs doing different things -and- one is in motion while the other is not. In the end, I think this trick - especially coming on the heals of Tandem Spin - will greatly aid our photography efforts. This reinforces that the dogs should pay attention to "their" hand, as well as that just because your bud is moving, doesn't mean you should be as well. Note that Zachary is taking on the much harder role here. Yes, I know that it appears like he is just lying there, but trust me, lying around Doing Nothing is (a) extremely counterintuitive to Zachary (b) not nearly as much fun as jumping over something and (c) makes one prone to being hit on the head by their klutzy compatriot. So, how did I teach this? 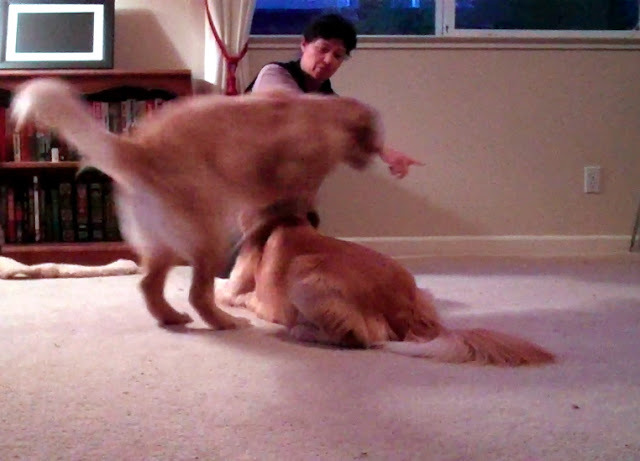 The first part was to get the dogs to focus on the correct hands. That meant feeding Zachary treats from my left hand (held low and out of view of the camera) while feeding Henry from the right hand (while he was generally moving around and being a pest.) The point was not so much to reinforce Henry's pestiness, but to show Zachary that lying around Doing Nothing was a good way to get cookies. Once they were paying attention to the correct appendage (which didn't take that long coming on the heels of last week's trick) I started tossing treats over Zachary's back - to the side Henry wasn't on - while at the same moment feeding treats to Zachary to get him to stay. 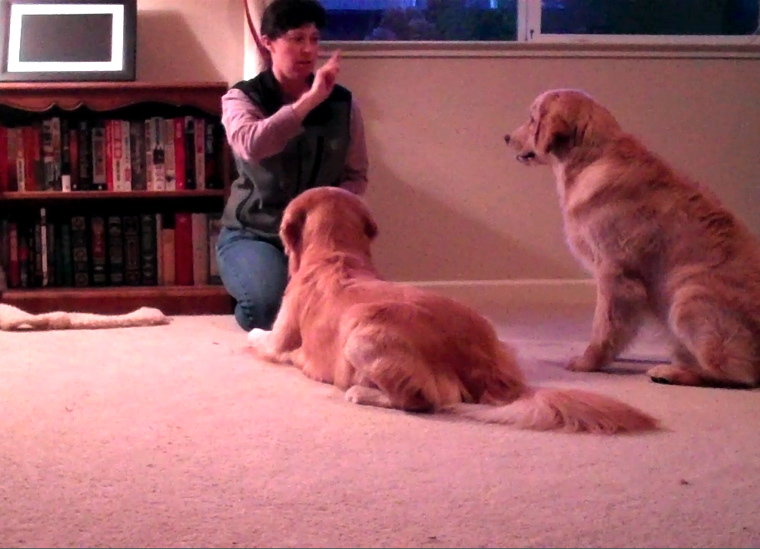 As soon as Henry jumped and grabbed his treat, I'd toss one back the other way, meanwhile Zachary got a steady stream of reinforcement for Doing Nothing. With repetition, I was able to transform the hand motions into the cues; a fist in front of Zachary = "stay" and a pointing/moving hand to get Henry to jump. Make a photograph illustrating a sound that catches your ear today. Since I spent so much time on the Trick of the Week, I won't bore you with the shoot details. For the record, I tried large cookies (all I got were pictures of ears), keys (nothing was in focus), bitey-face (see keys), ringing of the doorbell (they kept looking out the window instead of the door as I hoped) and finally, at long last, the shredding of the paper bags. WOOT!! WOOT!! Nice job with that trick boys! You should upload a video of you guys performing it. I'd love to watch. Oh what a discovery - you're great blog with your two goldens.... what fun to read how you train them. I have two labs - brothers and litter mates - one black and one yellow and while I've trained them to do some things I've never challenged them like you challenge yours - and yourself frankly. Great photos - and a wonderful blog... thanks for sharing your tricks and also the beautiful photos of the dogs... 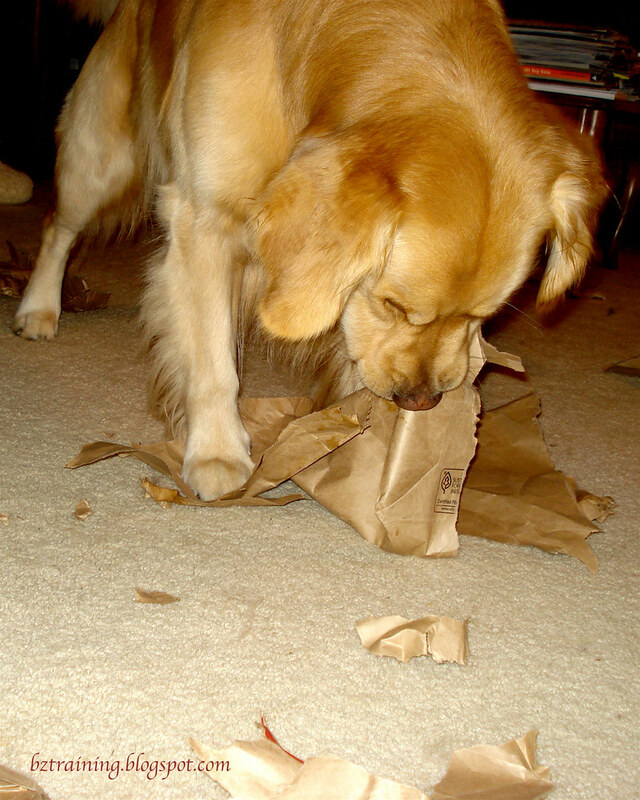 I loved the paper bag shredding... looks all too familiar! Very cool on the trick. What good boys. I loved the paper shredding. So greyhound like.